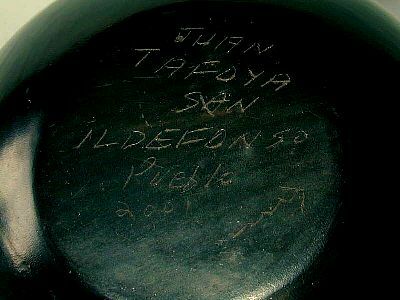 Juan Tafoya's signature on the black-on-black pot with the kiva steps and squash blossom design. He engraves his signature so that it is permanent, unlike most others that use pencil. This was one of the pots we watched him fire at his studio on the San Ildefonso Pueblo near Santa Fe, New Mexico on Oct. 15, 2001. 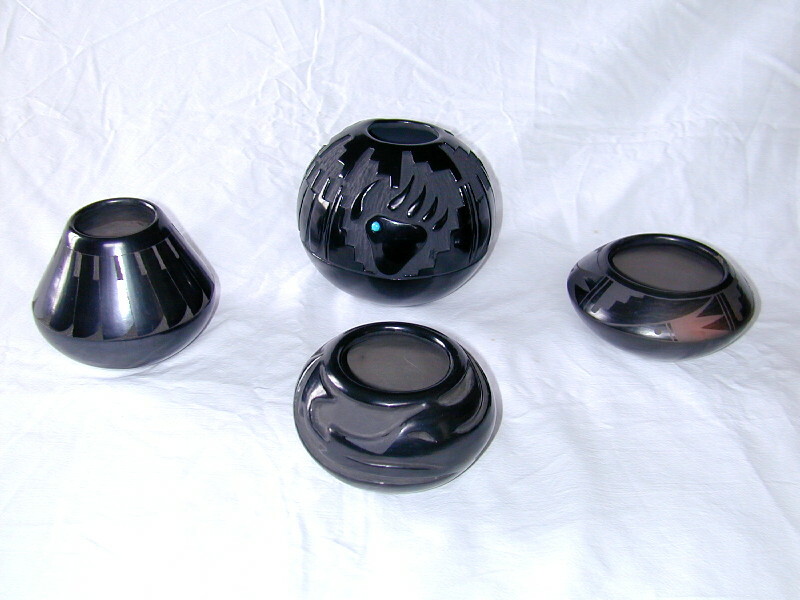 Our black-on-black pottery collection. On the left and right, two pots we purchased in Oct. 2001 from Juan Tafoya of the San Ildefonso Pueblo. In the front, a gift to Mom from Dad, a pot with the avanyu, or horned-water-serpent design by Frances Salazar of Santa Clara Pueblo. It measures 2 5/8 inches high by 4 1/4 inches in diameter. In the back, a gift to Mom from son Joe, a Navaho pot signed by "Kinlichew" with a bear claw design and torquoise inlay. It measures 4 1/2 inches high by 5 1/4 inches in diameter.